Audi makes great play of their prowess in aluminium construction. Most people assumed that this method was only used on moon buggies or premium models like the beautiful A8 limousine, but the A2 brought smart, lightweight manufacturing techniques to the likes of us. 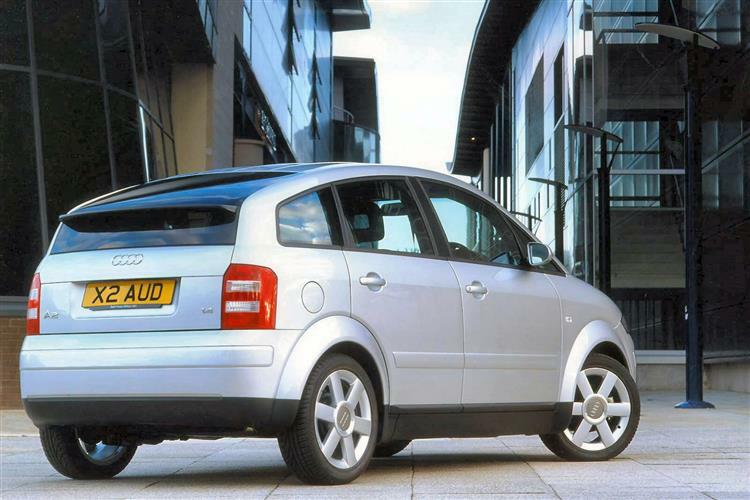 Make no mistake, this is the way of the future and as the world's first aluminium-bodied production car, the Audi A2 is something of a landmark. Landmarks are all well and good, but the used car buyer is more concerned with landing a good deal than landing on the moon. Does the A2 offer stellar value second time around or is it merely an expensive oddity? When designing the A2, Audi's engineers were faced with a dilemma. The car had to be steeped in the Audi brand values of quality and safety whilst wrapped up in slick design. Doors that thunk shut, cabins that drip with expensive mouldings and feel utterly bulletproof unfortunately tend to weigh a lot. Up the weight and you then have corresponding negative effects on performance and fuel consumption. Fortunately, the A8 luxury saloon had laid the ground with its aluminium construction and Audi continued the theme with the A2. First displayed to the world at the 1999 Frankfurt Motor Show, the A2 featured an Aluminium Space Frame body that weighed 43% less than conventional steel construction. Its kerb weight of just 895kg was by far the lowest in its class and superb aerodynamics helped fuel economy. It wasn't until August 2000 that the first A2 models went for sale in the UK, offered with either a 1.4-litre petrol or a 1.4-litre diesel engine. Customers also had the choice of either a standard or plusher SE trim level plus the usual lengthy options list. Whilst the A2's history is brief, the world's first mass-market aluminium-bodied car will doubtless leave a lasting legacy. In summer 2002 a mechanically unchanged Sport trim level was introduced. At the same time the A2 was treated to a slight upgrading in interior equipment levels and, more significantly, the fuel tank was made a good deal bigger. Just afterwards, a clever 1.6-litre petrol FSI variant was introduced and later we saw a 90bhp version of the 1.4-litre TDI. It was all up for the A2 by the close of 2005. The model never really caught on in the way Audi had hoped. The A2 makes no secret of its metallurgy, with lovely aluminium detail touches around the cabin on the gear lever stem, the glovebox catch and the instrument dial surrounds. The rest of the interior is filled with classy, soft-touch materials, complementing doors that shut with a quality 'thunk' and switchgear that feels hewn from stone. In its day, it was quite simply the classiest cabin of any small car yet made. Even by current standards, it's up there with the best. But it isn't the most versatile - especially compared with some of the classier mini-MPVs which may tempt the used buyer. Which, given that the A2 is only 12ft 6'' long, occupying less road space than any rival bar the rather cramped Mercedes A-class, is hardly surprising. Still, the two individually sculpted rear seats are removable and split fold flat in the usual way to extend the load bay from just under 400 litres to over 1,085 litres of space. The seats themselves are very comfortable and, though there's not much legroom at the back, you don't really notice thanks to Audi's 'Space Floor Concept' - a fancy way of saying that the rear footwells are lower than those in the front. If you intend to mostly carry children in the back and don't need the deeper footwell, the space can be filled with optional floor boxes. There's more innovation when it comes to the engines - though not in terms of the mechanicals themselves. What is interesting is that you can't see them - not unless you really want to anyway. The bonnet does not hinge open in the normal way but is secured by two plastic knobs which would normally only be released for servicing. For routine top-up items, you unclip the small shiny black plastic grille panel at the front: this offers access to the dipstick, the oil filler and the windscreen washer reservoir. At the wheel, visibility is generally good with the exception of thickly curved windscreen pillars that block the front three-quarter view badly. Less serious is the way that the sharply curved rear screen distorts the appearance of cars behind you, making them seem tall and narrow - rather like an A2 in fact. There's no rear wiper, which seems rather mean until you learn that the hatch glass is coated with a 'hydrophobic' coating designed to disperse water (but what about dried-on dirt?). And of course, the slippery shape (Cd 0.28) helps here too. Equipment levels include most of the basics, following Audi's usual base and plusher SE formats. Plus of course, there's a long options list, enabling you to carefully personalise your A2. Otherwise the recipe feels as good as the most luxurious Audi A8, from the slick fit and finish right down to the key - a chunky black transponder into which the key blade slots like a flick knife. If only the A2's shape was a little less dumpy. It's a testament to the quality of modern Audis that most used guides have nothing to report. 'no problems to report' or 'nothing significant' are the usual commentaries on the A2. Just look for main dealers service stamps, a sheaf of receipts and check for the usual accident or misuse damage. Other than that, buy with confidence. (approx based on an 2000 A2 1.4SE) With servicing every 20,000 miles and a flap that lowers to allow owners to top up fluids, running the A2 on a day to day basis is simplicity itself. Consumables are reasonably priced with an air filter retailing at around £18, an oil filter is £8 a fuel filter is £14 and spark plugs are £5 each. A cam belt will set you back in the region of £25. Not too painful, is it? Although the A2's styling may have provoked debate, the car's road manners are universally agreed to correspond to the VW/Audi template - not wildly exciting, but safe, sweet and imbuing the driver with a massive superiority complex. Mindful of the handling criticism originally directed at Mercedes' A-class, Audi cut no corners with electronic driving aids. Traction control and ABS with Electronic Brake Force Distribution backed up with ESP - an Electronic Stability Programme that automatically brakes individual wheels and throttles back should you enter a corner too quickly. As to which engine you should choose, though the 1.4 petrol unit is by no means a bad choice, the three cylinder TDI probably makes the most sense, given its near identical 0-60mph performance and much better fuel economy (50.4mpg as opposed to 34.4mpg on the urban cycle). Further diesel benefits surprisingly include better refinement, mainly due to the fact that the much torquier engine shouldn't have to be pushed as much for the necessary performance to be extracted. Which means less gear changing and a more relaxing drive all-round. The 1.6-litre FSI is a direct injection petrol engine and offers the best performance you'll get from an A2. It's also fractionally more economical than the 1.4-litre petrol with a claimed 48mpg average. 0-60mph takes 9.8s compared to over 12 seconds with both of the other powerplants. If you can find one that' fits your criteria for budget, condition and colour the Audi A2 is a sound used buy. Once you've swallowed the big admission fee, the A2 is economical to run, looks set to offer exceptional reliability, comes with guarantees of a clean environmental conscience plus, it should do well on residuals. It's certainly no bargain, but then if you're part of the target market, the upfront cost won't worry you unduly. Domestic asset management has rarely been so easy.